Motivational Inspirational Humor and Speeches for your Convention or Meeting - What Brett Does! Whether straight stand up or a humor based presentation, your program will feel upbeat, can-do, and life affirming. Above is a one minute video showcasing the sound of fun in store for your group. Brett has written 2½ hours of spoken word material comprising 90 minutes of clean, upbeat comedy and 60 minutes of light, funny stories. For conventions and meetings, he arranges the jokes and stories into presentations and speeches to suit the situation, address a theme and the needs of the client. Brett can do a straight comedy set, one of his two humorous presentations, a workshop, or his one man show. He enjoys working with the meeting manager and blending the jokes and stories into a customized arrangement, a new whole. He can present a 45-60 minute keynote followed by a 50 minute workshop with no overlap in comedy or story. How to laugh off a long week and to celebrate a good time; a fun night out turns a tough day around. 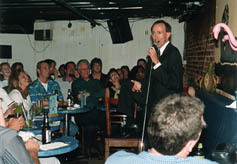 Just the jokes -- clean and funny -- you’ve heard in comedy clubs, on public television, on the comedy CD, Genius with a J. Clients include:Comedy club performances since 1983 and after dinner entertainment for, among others, the Department of Defense/Joint Forces Command, IBM, The Smithsonian Associates. How to manage stress to overcome challenges and broaden emotional well being. This funny healthcare keynote speech consists of jokes plus health related stories. Health stories we can choose from include chronic illness, brain injury, in-home care, traveling with a difference and how to identify abilities and raise the bar for peak success. How to motivate teachers to become ‘make a difference’, extra mile educators. This funny educational keynote presentation includes 20 minutes of school jokes plus light storytelling about a supportive learning environment. School stories include profiles of 3 teachers who model the thinking, caring beings we can become. Clients include: National Science Foundation, U.S. Department of Education, Office of Special Education and Rehabilitative Services, New York State Teachers Union, West Virginia Department of Education, Florida Special Education Teachers and Paraprofessionals, Virginia Department of Education, and, in Virginia, 25 city and county public school divisions… and counting. The Power of a Yes is a 5 minute video on Vimeo of some standup along with samples of the teacher stories illustrating how educators can model the beings we could become. How to have more fun and be more productive at home and at the office. I can do this 50 minute workshop as a follow-up to the educational keynote or the healthcare keynote. How an out of work college graduate found a job when he discovered a passion. I'm the leading man in a one man show. I play me, and it's a stretch. 1) How are shows tailored to meet the client’s needs? Here's a 90 second video of jokes I told on a recent trip to Northern Virginia. 2) What is corporate comedy? Corporate comedy is clean funny standup comedy plus light storytelling both of which break out humor and illustrate its instrumental use in conflict management, creative thinking, and transformational leadership. I include a story about customer service and how my experience as a consumer was enhanced when employees used humor to help. 3) Are there themes that run through all the stories? Yes – Themes that run through all the stories include managing change, maintaining a positive attitude, creating humor cultures. Caring about how we think can evolve into thinking about how to most effectively care. Caring about how we think and thinking about how to care both arise from the “the things in life that don’t make sense” and each is most effectively treated using humor.